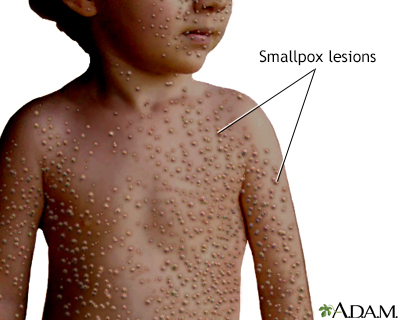 Smallpox is a contagious disease caused by a virus. Smallpox virus has been eradicated worldwide through successful vaccination and treatment programs, and now exists only as a stored virus in a few research centers. Symptoms include a severe rash that leaves scars, fever, headache, vomiting and diarrhea.